Micronesia's OLPC journey is off and running with the Official Handover ceremony of 810 XO laptops on the remote island State of Kosrae. The program comes after teacher training workshops funded by the Secretariat of the Pacific Community, OLPC's deployment partner in Oceania. Kosrae's program is funded by the United States, a significant and most welcome commitment from the largest aid donor in the northern Pacific, and a move that will ensure sustainability in a country heavily dependent on external aid. The Marianas Variety reported comments by US Ambassador to the Federated States of Micronesia, Peter A. Prahar at the handover ceremony on July 7. Noting "the importance of embracing the digita l age," Ambassador Prahar challenged Kosrae's parents and teachers to use the program to “embody and win the solid commitment and active participation of all of the stakeholders in the Kosrae education system.” Proof of that commitment could be seen immediately in Kosrae's inclusion of its special education students in the launch activities. Kosrean Special Education students show off their new XO laptops . 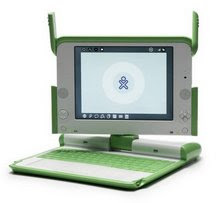 Social inclusion is at the heart of the OLPC approach in Oceania, and the provision of laptops to every child is a signal from tiny Kosrae -- population 6,600 -- that neither disability nor the vastness of the Pacific need be barriers to a better quality education for all our children.